Cisco CEO John Chambers announced during CES 2014 that based upon Cisco’s figures and predictions, the Internet of things would become a $19 trillion market within the next decade. Chambers has repeated this figure at Mobile World Congress (MWC) 2014, stating that the Internet of things will have an even greater impact on the world than the Internet itself. The Internet of things is made up of any device that can eventually be connected to the Internet in order for it to “talk” with other devices that impact an individual’s life. As we saw at CES 2014 in January, many companies are beginning to come out with Internet-connected appliances, but making them connected to each other is more difficult and requires some level of cooperation, even between direct competitors. By 2020, Chambers expects that there will be 50 billion Internet-connected devices around the world, compared to just 10 billion in 2010. This figure is based upon the predicted growth of the Internet of things, which will presumably make it progressively easier for companies to come out with smart devices. When looking at how the Internet of things will actually affect consumers, it is easy to see how Chambers thinks that it will have five to ten times the impact on society as the Internet has had. This is due to the simple fact that in many “futuristic” movies, the Internet of things is something that is always present. Chambers applauded places like Barcelona (where MWC is held) and Israel for their continued work towards creating smart cities. He also noted that AT&T is doing great work through its Digital Life service, which specializes in various forms of connected devices. 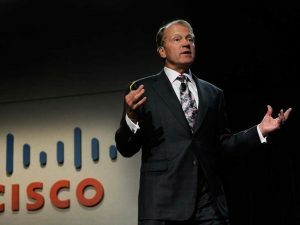 Summary: According to Cisco, the Internet of things will be a $19 trillion industry within the next decade, as more devices and geographic locations adopt connected devices.